This building still stands on 9th Street but the Third Presbyterian Church congregation merged during the past 20 years with First Presbyterian Church. The building currently houses the Chester East Side Ministries. "The Third Presbyterian church is situated at the S. E. corner of Twelfth and Upland Streets. The lot was purchased in 1871, and the walls of a memorial Sunday School Chapel were built, partially (in commemoration of the union of the churches of the old and new school) on the lot, by the residents of the neighborhood, connected at that time with the first church, of which the Rev. A. W. Sproull was pastor. In Oct., 1872, sixty-two members of the first church took letters of dismission, and were organized Oct. 16, 1872, into the "Third Presbyterian Church of Chester." The building upon the lot was immediately finished, and served as a chapel until July, 1873, when proving too small, one end was removed and 25 feet added to it. The Rev. Dr. Edwin W. Bowers, of Lincoln University, was temporary minister of the church, as stated supply, until Feb. 13, 1873, when the present pastor, the Rev. Charles F. Thomas, was called, and installed May 6, 1873. "The lot upon which the chapel is built is 146 feet square, and cost $3000, while the total cost of the present brick edifice was about $8000. The church commenced its first year with 62 members, and 40 scholars in the Sabbath School. The total membership in Jan., 1874, was 81, the congregation 400, and in the Sabbath School 350 scholars." 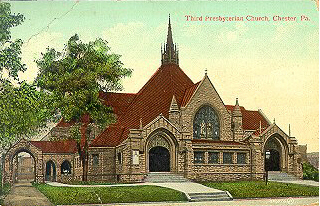 The Third Presbyterian Church, Chester, Pennsylvania, originally located at Twelfth and Upland Streets, was founded as a mission of the First Presbyterian Church. The original building later housed the Siloam Methodist Episcopal Church. On October 16, 1872, after the Presbytery of Chester approved the formation of a new church, the Third Presbyterian Church was organized with forty-nine members. The cornerstone for the new church, located at Ninth and Potter Streets, was laid on July 11, 1895. Opening services were held on May 17, 1896. The original Summer Bible School was held in 1912. At its peak, 650 to 700 students participated in the 5-week Summer Bible School. The First Italian Presbyterian Church merged with the Third United Presbyterian Church on September 12, 1965. "[Third Pres] As my parents called it. I attended during the 50's and early 60's. I mostly remember the shrinking membership as most people attended churches in the suburbs. I lived in Garden City but we trekked into Chester mostly every Sunday. I do remember the church had a small gym or court where they played volleyball. I also remember a Halloween party in the basement. I took some friends and we had a wonderful time. I remember Mr. Osman wearing some costume as a mad scientist or something like that. I can't imagine what it would cost to build a place like that today. We used to park in the back lot and go into the back entrance. We would leave that way also. "Mother" wanted no part of "standing in some line" after the service was over. lol Thanks for the memories."